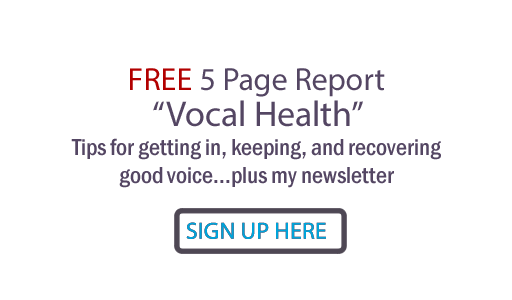 Strengthen your middle or mixed voice! This is also known as bridging or covering, mixing your registers without a vocal break so that you seem to have one connected register rather than two or more. Some vocal teachers have a problem with calling it 'middle or mixed voice', but I like to use this term, because the area we're talking about is mixing vocal resisters in the middle of your range. Call it whatever works best for you. 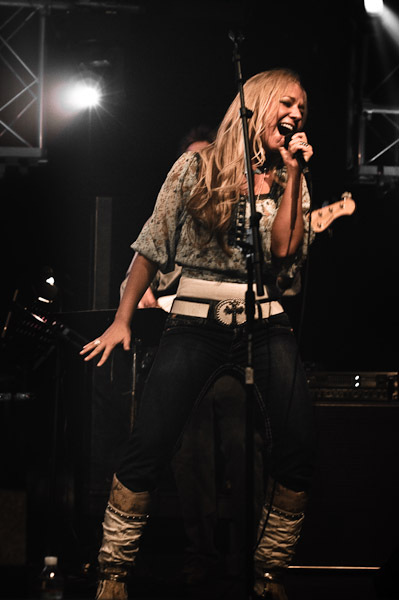 When you work on developing your middle/mixed voice, you will be strengthening the muscles and creating flexibility you need to sing higher in full voice, raising your singing range for contemporary voice. How? When you do vocal scales and exercises, try backing off pressure as you go up. As you go up, lean back just a bit, but don't lift your chin. Stay flexible. Mentally intend to make the top of your chest voice sound almost like the bottom of your head voice. In fact, I create a lot of vocal exercises that involve singing the high note in chest, then head, then in middle voice or mixed tone. Do sirens, bubbles and trills across your whole range, trying not to break. If your voice breaks at a certain point, try smoothing it out with a yawning sensation through the area. Some teachers call this 'covering'. If your head voice is not strong, focus on working it out more to balance strength between your CT and TA muscles (which work your head and chest voices respectively). You need this balance for a smooth register transition, to be able to lift in chest voice without 'going all the way over' to head voice, and to do so with no vocal strain. Get rid of tension in your neck, jaw, shoulders... which can interfere with the tilting action of the thyroid cartilage. This tilting action is directed by the automatic nervous system to enable the vocal cords to produce higher pitches. Interfere with it and you will strain for your highs. Middle voice, mixed voice, bridging, covering. Whatever you call it, if you want a bigger vocal range, get it... and get used to it! Wow! Great advice. Several things in this blog were quite helpful. Would love to see a blog on what to eat before you sing. I know people who will not eat before a performance. Others swear by greasy fries. Michael Bolton does hot coffee, KD Lang drinks a full can of Coke. I had a friend fly in from LA to do a session and said all the cats out there are now eating potato chips. ???? Me... I sing best after a burger. It's true. Go figure. I'm a tenor guy ala Journey, Boston, etc - who has been constantly abused by bands assigning me glass shattering songs to sing five nights a week. Anyhow... Just curious what everyone else has luck with. Vinny Ribas is a long time friend all the way back from CT. He speaks highly of you. Hope to have time to meet you in person one day. Hi Dan... thanks so much for your comment! I will follow up on your suggestion... soon to come will be a blogpost on what to eat before performance.